The Telefomin Hospital has received much needed medical equipment through an Australian High Commission Direct Aid Program (DAP) grant. The equipment will support the hospital to deliver better services to the people of West Sepik, particularly antenatal, obstetric and paediatric services. The equipment, delivered with the assistance of the Australian Defence Force, includes items such as baby scales, stethoscopes, vital sign monitors and suction equipment for the delivery room. Australian High Commissioner, Bruce Davis, was pleased to provide the equipment. 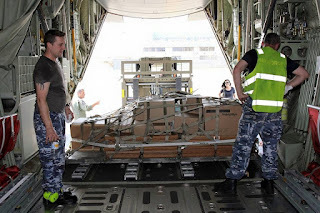 Caption:The medical equipment being loaded onto the Australian Defence Force aircraft.